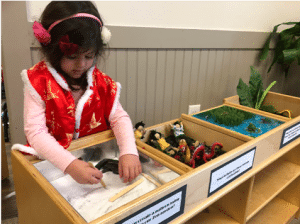 The Preschool B class had so much fun discovering the wonders of China. We started this exploration through our study of panda bears. While examining these wonderful mammals, the children wondered why we couldn’t go to China to visit them. I quickly explained how we would need to travel to China with a passport on a plane. We got out our globe and found the continent of Asia. As a class, we discussed how the continent is all the way around the globe. Through our research, we discovered that China is 7,682 miles away. The students became very interested in the far away country, so we decided to explore it in greater depth. First, we began discussing the Great Wall of China. We discovered that the Great Wall is over 4,000 miles long and 10 soldiers wide. We lined up 10 children side-by-side to get an idea of how wide it really is. They were even able to design their own Great Wall by using blocks and natural materials. 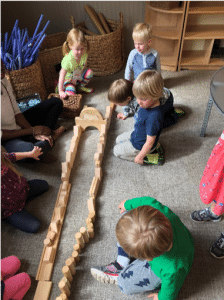 After this initial investigation, the children started to show a heightened interest in the architecture of China and wanted to continue down this path of discovery. We added to our great wall by creating the forbidden city. The students were divided into groups, and each one selected a landmark to replicate. As the class continued to expand upon their knowledge of China, they began researching it through art and science. In art, they started to investigate the habitat of the panda bear. The students created their own habitats using transparency paper and natural materials. After discussing the vibrant green vegetation, which pandas live in, the students began discussing Chinese gardens. As the students examined several photos of China, they became intrigued by the beautiful gardens and landscape. The class had so much fun learning about the exotic plants, which thrive in the country, such as orchids, bamboo, willow, plum blossoms, cherry blossoms, and hibiscus. We noticed that many gardens have ponds full of koi fish. The classmates were instantly fascinated by the koi fish and happily discovered the meaning behind the koi and why they are found in so many Chinese gardens. The Preschool B class realized that koi are so prevalent in China because they symbolize that great achievements are possible with hard work. Legend says that koi fish used to climb up big waterfalls and are known to live longer than any other fish in China. After extensive research, we found out that koi fish are a mix between a goldfish and carp. 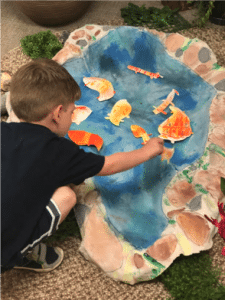 To conclude our studies, we created our very own koi pond for the classroom, this finished masterpiece can be found in the project pod.